But before my answer, konting kwentuhan muna. So last Wednesday, my sweet Tumblr kid and Anagon model Jesrhel Co invited me to the UNIQLO Cast Announcement Party at the beautiful Hotel Intercontinental in Makati. The global apparel brand from Japan announced the complete Cast of highly admired Filipino personalities to embody its MADE FOR ALL Philosophy. Attended by people of the press, they introduced the international brand UNIQLO as a subsidiary brand of Fast Retailing Co., a leading Japanese retail holding company that offers clothing under a number of brands including Theory, G.U., Comptoir des Cotonniers and Princesse tam.tam. UNIQLO is most known for its simple and well-designed clothes. Don't we all love apparel and brands from Japan? They always prioritize quality! I love how they introduced their brand ambassadors through silhouette first, to excite and pump up the crowd. A swirling-twirling guy to the tune of Mister Swabe. Alam na! Chito Miranda of Parokya ni Edgar came out, not from the stage, but from the back of the venue! ;D I'm sure crazy idea niya yung fat guy silhouette! Witty and life of the party, I love Chito Miranda not only for his punchlines--but also for his heartfelt PNE songs like Halaga and Buloy. Sayang walang sample! They all agreed that "the Filipino Cast members exemplify the MADE FOR ALL philosophy in their own daily lives. Each cast personifies different characters – sporty, fun, witty, serious, spontaneous -- bringing out their own individualities. Despite these differences, they find a piece in UNIQLO that suits their distinct preference. Through Chris, Iza, Chito and Nikki, UNIQLO trusts that Filipinos will identify themselves in every product offering that the brand is set to bring to the Philippines." I love Chito Miranda's humor, sobrang jester! By liking UNIQLO Philippines' FB page, you can access their app where you can vote for your favorite UNIQLO tee...And even get a chance to win a trip to Japan! Thank you Paul, Nicole, and Kelly! OKAY! 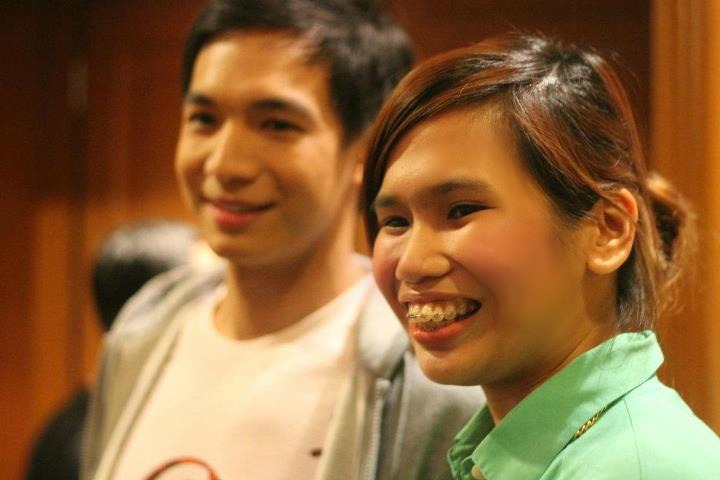 So what's that one line I was able to (awkwardly) utter when we had the chance to take a quick photo op with Chris Tiu? When we decided to approach Chris for a picture, I was struggling inside my head (struggling talagey? lol) kung ano ang pickup line I'll throw to him. Eto na ang chance! Hahaha! Parang Mario Maurer Moment lang! I used to (walang choice e, haha) watch the Blue Eagles versus my UST Growling Tigers because my friend Geo Hernandez was (still is actually!) a big supporter. I think that was around 2008, we watched the UST-Ateneo games together, kahit we have different teams, kahit na we end up not talking to each other after every game. Lol. And even though we often lose to their team (hindi nga lang often e, parang, palagi! Haha! ), I never disliked Chris Tiu --I really admire the former Blue Eagle for being humble. And weakness lang talaga basta basketball player! Lol. Have you read the 2008 article How do you raise a Chris Tiu? Lalong nakakainlove! So back to the UNIQLO event, before leaving, Chris took notice of our IDs and said "Oh bloggers!" And being my paimpress self, I found the chance to break the silence. UNIQLO Philippines opens on June 15 at the SM Mall of Asia. grabe di halata na sobrang peg lang si Chris Tiu... Super love Uniqlo talaga. Hope to see you soon!